Considering the place she holds in our hearts and the gigantic cat scratch that she's made on the pop culture landscape, it's pretty amazing to think that Lil Bub has been around for just over a year. Let's take a moment out of our day to recognize the accomplishments of this kitty prodigy who has done so much good in so little time. 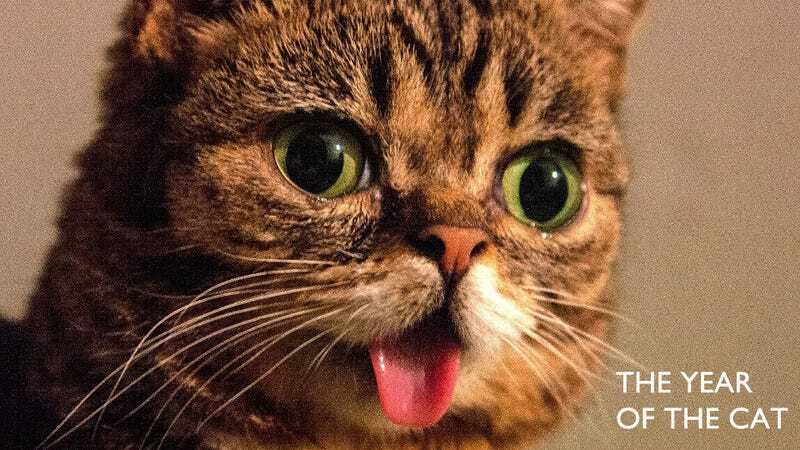 Let's look at the year in Lil Bub. Lil Bub made her debut in November of 2011, but really that's just a technicality since she didn't gain steam until 2012. Still, check out her first YouTube appearance from when she was just a kitten. Slow motion video = fast trajectory to fame. November 8, 2011: The birth of the Lil Bub Tumblr. Also from November 2011: Lil Bub yawns for the first time on camera. Lil Bub's first video of 2012. May 2012: Lil Bub is happy with her growing success. May 27, 2012: Lil Bub gets social media savvy and joins Facebook. This is her first uploaded photo. June 1, 2012: Lil Bub joins Twitter. Her first tweet only gets one retweet. On July 2, 2012, Lil Bub thrills the world when she shoots her first outdoor video. July 9. Lil Bub hangs out with a dog. Is kind of a jerk. August 13. Lil Bub speaks. On August 30, Lil Bub had an encounter with a very lucky Jezebel writer. September 2012: Vice releases a teaser for Lil Bub & Friendz, a Lil Bub documentary. Also in September, someone makes the best decision of their life and gets a Lil Bub hand tattoo. October 12. Lil Bub gets a regular spot on the Friday Zone. On November 22, Lil Bub practiced her hunting skills. November of 2012 takes Lil Bub to the bright lights, big city. December 11, 2012: Lil Bub, now a legit celebrity, teams up with fellow celebrity Andrew WK for a good cause. Let's toast to 2012, a new year in Lil Bub. All Lil Bub images via Facebook.